How do I manually submit outstanding student quiz submissions? When a student views a timed quiz and time expires, Canvas auto-submits the quiz. However, if a student navigates away from the quiz page, the quiz submission remains outstanding. 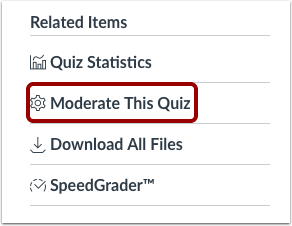 On the Moderate Quiz page, Canvas generates a warning message about the outstanding submission. 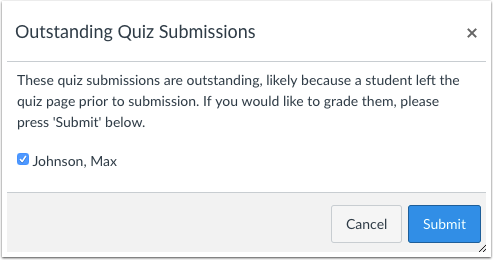 This lesson shows you how to submit any outstanding submissions for a quiz at one time. When students leave an untimed quiz without submitting, their submissions will not be considered outstanding. These submissions will be submitted and considered outstanding after an event occurs that attempts to calculate their quiz grade. These events may include ending of availability dates, deleting or editing the quiz, attempting to view the outstanding submission, and editing an assignment group. Click the Moderate This Quiz link. At the top of the browser window, click the Check on outstanding quiz submissions link. To grade outstanding submissions for the selected student(s), click the Submit button. View the updated submission(s) and score(s). Previous Topic:Once I publish a timed quiz, how can I give my students extra time? Next Topic:How do I view student results in a quiz? 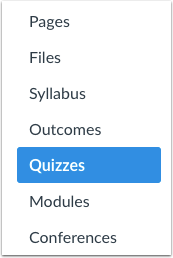 Table of Contents > Quizzes > How do I manually submit outstanding student quiz submissions? Re: Untimed quiz that auto-submitted after the available until date?